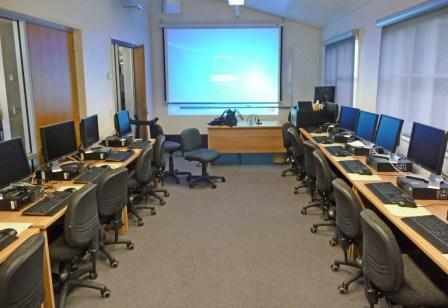 Most of our training takes place in the Boilerhouse Community Resource Room at The University of Southern Queensland, Ipswich. We have fifteen computers plus a presenter's computer which controls a projector. We also have a networked colour laser printer/scanner and of course a broadband internet connection. Our teaching philosophy is that the trainer demonstrates procedures through the projector and trainees follow this example, thereby gaining hands-on experience. For most sessions we provide assistant trainers who help anybody who gets behind. Follow the links for details of the Computer Courses and Workshops. To find the training room, drive in at the MAIN ENTRY at the end of Salisbury Road and continue straight on at the first roundabout. This will take you around the outer perimeter of the campus until you see the Boilerhouse Chimney on your left (Building No.22). Turn left by the Boilerhouse onto Village Lane and leave the University onto Parker Avenue where there is ample free parking. Click here for map and directions (but ignore the advice on parking thereon). Persons with disabled parking permits may park for free immediately outside the Boilerhouse. Our Boilerhouse Training Facility is provided by The University of Southern Queensland and with the generous assistance of other sponsors. Our Introductory Course is offered at the Internet Kiosk in the Humanities Building in central Ipswich.